Ultiworld’s 2017 Women’s College Awards are presented by the National Ultimate Training Camp and VC Ultimate, as part of their season-long support of our women’s coverage. All opinions are those of the authors. Thanks for supporting the brands that make Ultiworld possible! Ultiworld is pleased to announced our fourth annual College Awards. The criteria for each award can be found here — we consider both regular season and postseason performance in our selection of awards. Though the input of Ultiworld reporters is weighed heavily, final decisions for awards are made by the editors. To see the Player of the Year Award, go here. Julia Schmaltz has been one of the biggest stories of the 2017 season and she owes that to one thing: her goal scoring prowess. She had that insane, 10-goal performance in Texas’ national semifinal against Colorado, but she also led the Nationals field with 38 goals. That’s five more than the second highest scorer and 15 (!) more than third. But Schmaltz’s performance at Nationals was far from a flash in the pan. She’s been staggeringly prolific all season — particularly at the Stanford Invite, where she ran roughshod over just about any defense that tried to slow her down. Her successes are borne from a skillset that is unique to the division. This season was just her second ever in the sport, and no, she’s not yet the most complete offensive weapon in the game. But her pure athletic gifts made her an unstoppable force when playing against anyone not named Jaclyn Verzuh this year. A former scholarship high jumper at Oklahoma State, Schmaltz has a special blend of height, speed, and jumping ability. Those physical attributes made her a dominant force downfield, able to sprint away from defenders and able to posterize them with skies whenever they were (un)lucky enough to be within a camera’s view when she caught the disc. Schmaltz’s growth over the past two seasons has been remarkable. Despite still being relatively inexperienced, she isn’t entirely reliant on her superior athleticism. She’s learned how to read the field and knows when to strike to most effectively finish off offensive moves. When Texas was looking to work their redzone offense on the last point of the national semis, Schmaltz wriggled free into open space for the game-winning score. That goal was less physically astounding than the slam dunks she rattled off on Colorado’s defenders throughout the rest of the game, but it perfectly demonstrated the practical intelligence that guides her athletic tools and makes her so dangerous. Schmaltz may not be a dangerous thrower, but the ways in which she can beat defenders downfield make her a multidimensional threat anyway. It’s her combination of special athleticism and ability to maximize it with on-field intelligence that make her our Offensive Player of the Year. Han Chen is not only one of the best players in the division, but she’s also the highest impact defender in the division. A major part of UCLA’s dominance this season were their zones, and Chen’s role as the deep made each of them possible. With Chen deep, UCLA might as well have added four additional defenders for opponents to contend with. Awarding Defensive Player of the Year to a zone-based defender is tough.1 Zone only works if all seven players do their jobs, right? Isolating one player for their excellence in a zone not only ignores the other six players involved, but it also makes that one defender seem like a one trick pony. Han Chen isn’t a one trick pony — she’s the thoroughbred of zone defense. Chen’s closing speed, vertical, and ability to read the disc give her free reign to roam the back 40 yards of any field. No matter what someone attempts or where they shoot, Chen can get under the disc to make a play. Recorded stats for Nationals only give Chen credit for 8 blocks throughout the weekend. What they can’t capture are all the holstered deep shots that handlers thought twice about, knowing Chen was there. On a turn, Chen takes command once again. Her low backhand breaks and hammers initiate UCLA’s offense, and her pinpoint hucks were unguardable. Playing deep in the zone also means she gets more rest than other teams’ star players, and she’s all the more lethal when UCLA gets the chance to break. The comparison to Sandy Jorgensen is made often and with good reason: they’re both pushing the ceiling of how a great deep can shape a zone. They prove that a specialized role, performed at the highest level possible, can come to define a team and determine their success. Han Chen did just that for UCLA in 2017. 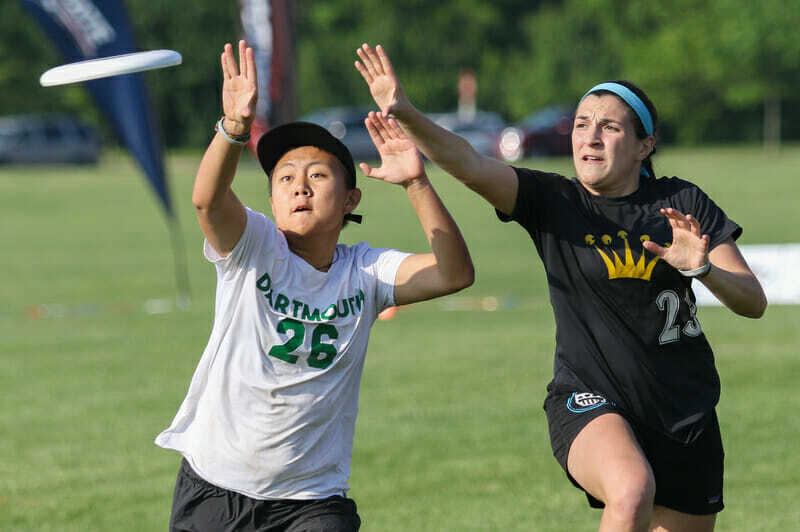 Splashing onto the scene this year, Dartmouth sophomore Caitlyn Lee proved to be an emphatic and brazen playmaker that enriched and expanded the top end of the championship roster. 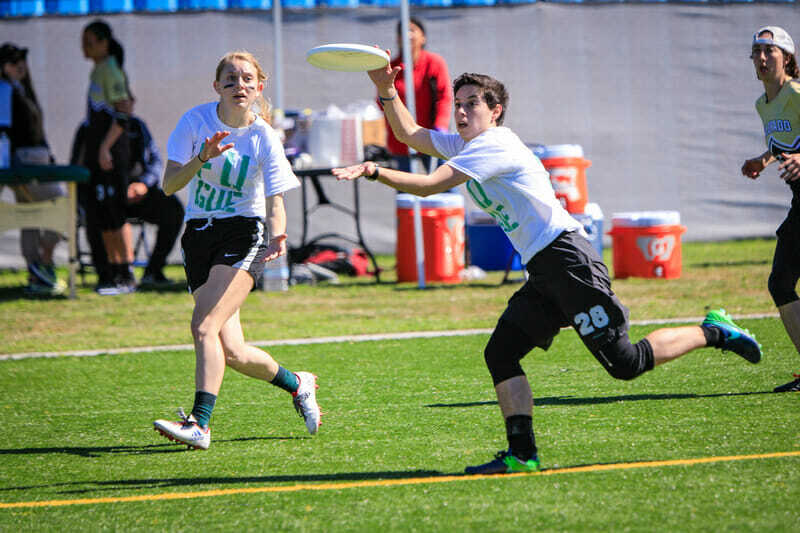 Lee drew attention all the way back at the beginning of the spring, playing a major role for the team at Florida Winter Classic, reducing Princess Layout’s reliance on their veteran stars. She was a frontrunner to win this award coming into Nationals and solidified her spot with a very impressive performance in Cincinnati. Lee was third on the team with 19 goals, up from just three scores in 2016, while adding eight assists. She came through in the clutch, tallying eight goals in the semis and final, including a turnover-free showing in the national championship game. Two of those goals came on huge two-handed layouts in the upwind endzone, scores that shook the foundation the opposition was trying to build. It’s clear that Lee has all the makings of a star player in the college division. She’s comfortable swapping from throwing-focused roles into cutting, is a capable defender, and isn’t afraid to take smart risks. 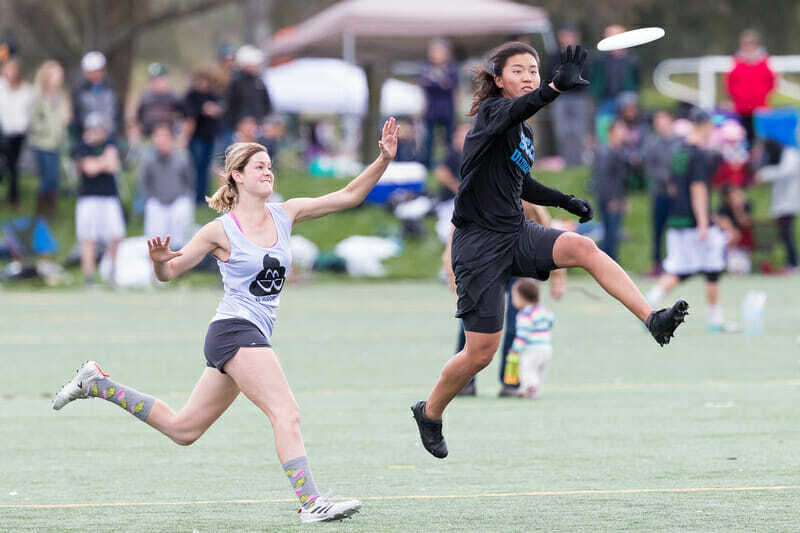 Now that she’s signed on for Boston Brute Squad this club season, everything is aligning for Lee to be one of the names to know on the reigning champions. It’s somewhat poetic for Maddie Boyle to win this award. Maybe too fitting. The last time an Oregon Fugue player won this award, it was 2013, when Hayley Wahlroos took home the first ever Ultiworld ROTY. Wahlroos is now a decorated senior and may be turning the keys over to Boyle and company. It’s also fitting because Boyle arrived as needed reinforcements right as a vaunted senior class left. That class was led by then Player of the Year Jesse Shofner. And it’s hard not to see a little Shof in Boyle’s play. She’s small, but hard-nosed and tough, unafraid to challenge taller players. Boyle is speedy, aggressive, and unrelenting. She has a penchant for making difficult plays. There were other rookies asked to do more, but not many who maximized their impact so effectively and caught your eye with their intensity and how well they fit with their team’s identity. Maybe she didn’t have an eye-popping Nationals stat line, but Boyle did pass the eye test with flying colors. Her activity, hands, and athleticism made her an impact player from the beginning. Expect a significant role expansion for Boyle as she becomes one of the top players on one of the division’s top programs at a young age. It looks likely she will continue the legacy for Fugue. Rosters change year to year and great coaches are able to adapt in order to keep their team competitive. The even tougher task may be to take the same roster and completely shift its style. Yet in 2017, the Colorado Kali coaches Lauren Boyle and Claire Chastain did just that. They turned their roster’s biggest regular season weakness into the team’s biggest strength at Nationals and they helped Colorado tap into their potential at the perfect time. As a result, Boyle and Chastain helped Kali end a two-year quarterfinals rut to reach the semifinals. Kali’s Achilles’ heel all season was zone offense. Colorado Kali prides themselves on their person defense, but as a result they rarely practice against tough zones. The team’s preferred high tempo didn’t pair well with the slow, steady patience that zone offense often demands. At Presidents’ Day, handlers and cutters alike struggled against the fearsome zones of UCLA, Oregon, and California. They were a different team at Nationals. They not only survived the zones thrown at them in Cincinnati, they thrived in them. In addition to overcoming the throwing challenges that plagued the team at the end of the regular season, Kali’s strategy in zone offense was more possession-oriented than momentum-oriented at Nationals. Handlers took fewer gutsy shots over the top, and cutters took the five-yard gainers instead of attempting the 15 or 20 yard shots once past the cup. The cause for this shift could just be an adjustment from the talent on the field, but a transformation this specific usually stems from someone else’s efforts, too: the coaches. Colorado still had the best person defense at Nationals and they were certainly still feisty. But Boyle and Chastain helped them tap into a calmer, more confident core that made all the difference in tough games. Together, they molded years of Colorado’s potential into an elite squad that was only three points short of a final appearance. 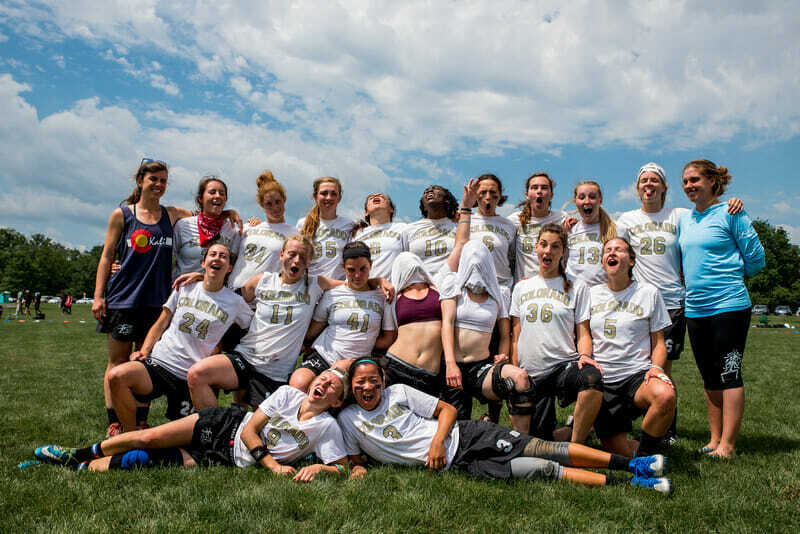 Comments on "2017 Women’s College Awards, Presented By VC Ultimate & NUTC"